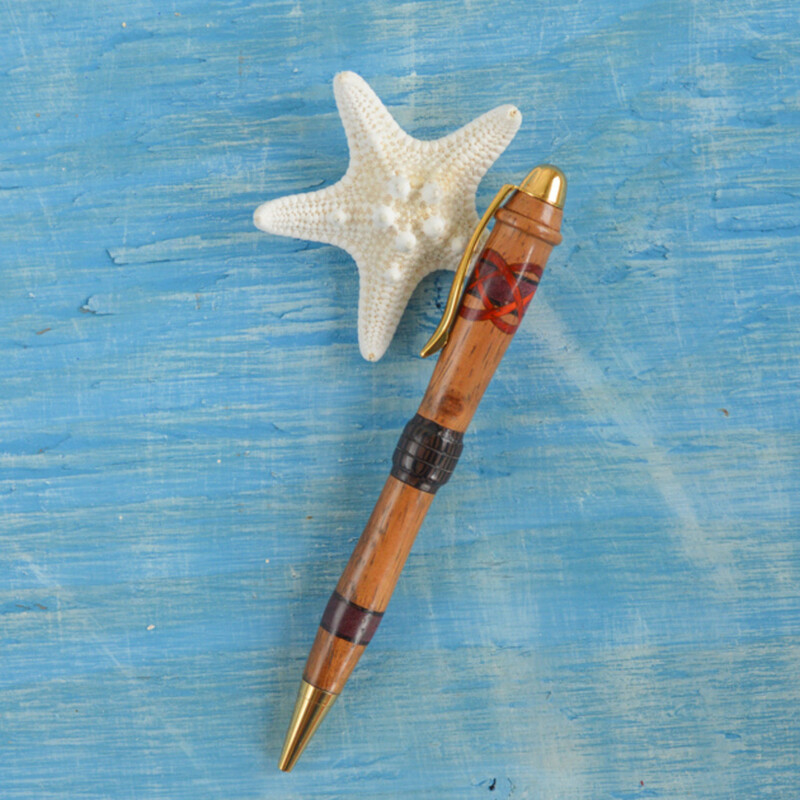 Wood pens are very popular in Hawaii. 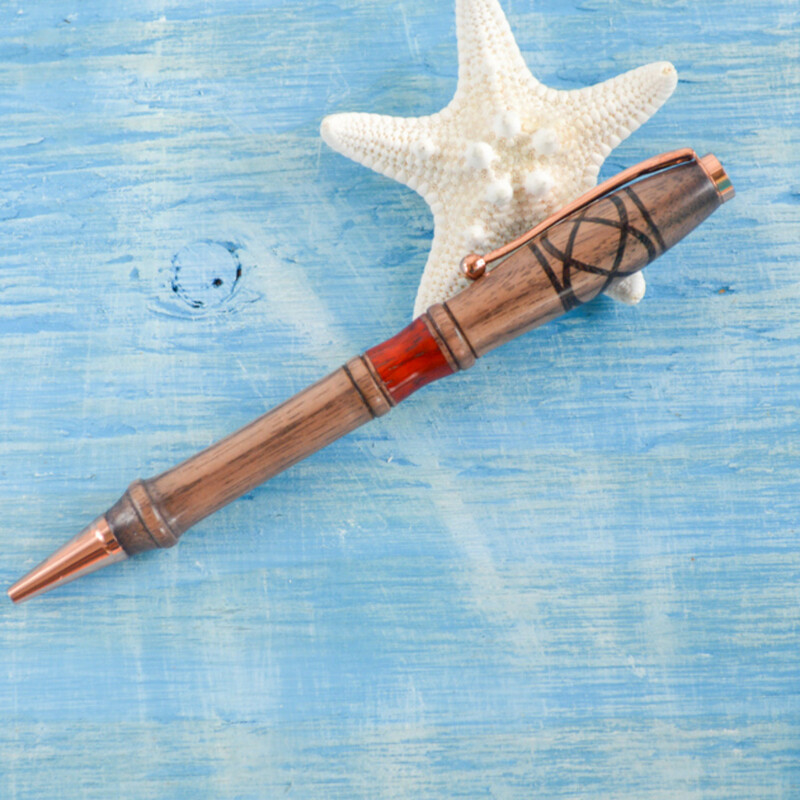 I remember the first time I saw a display of hand turned wood pens on a visit to the Aloha State - I was absolutely amazed by the beautiful woods and seemingly impossible designs. Now that I know how to turn pens, I can appreciate the beauty of a well-crafted pen, but am usually a little less awe-struck. 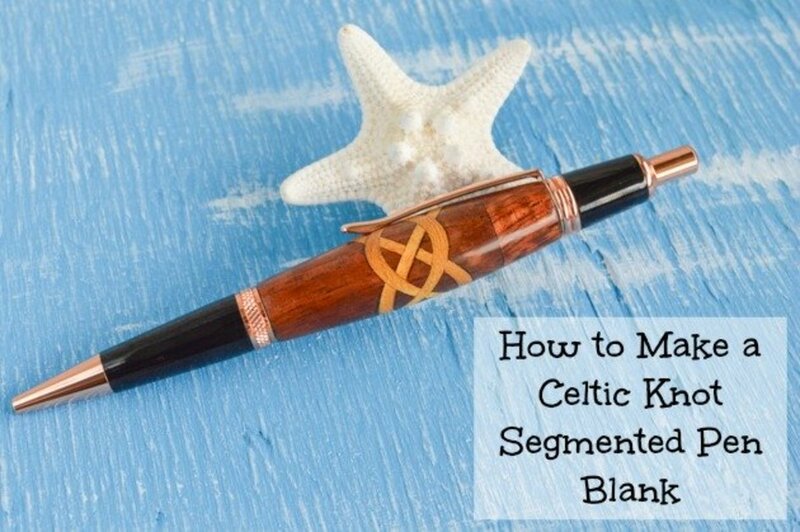 My absolute favorite thing about pen turning is creating segmented designs, and the Celtic knot design was the first elaborate blank I created. 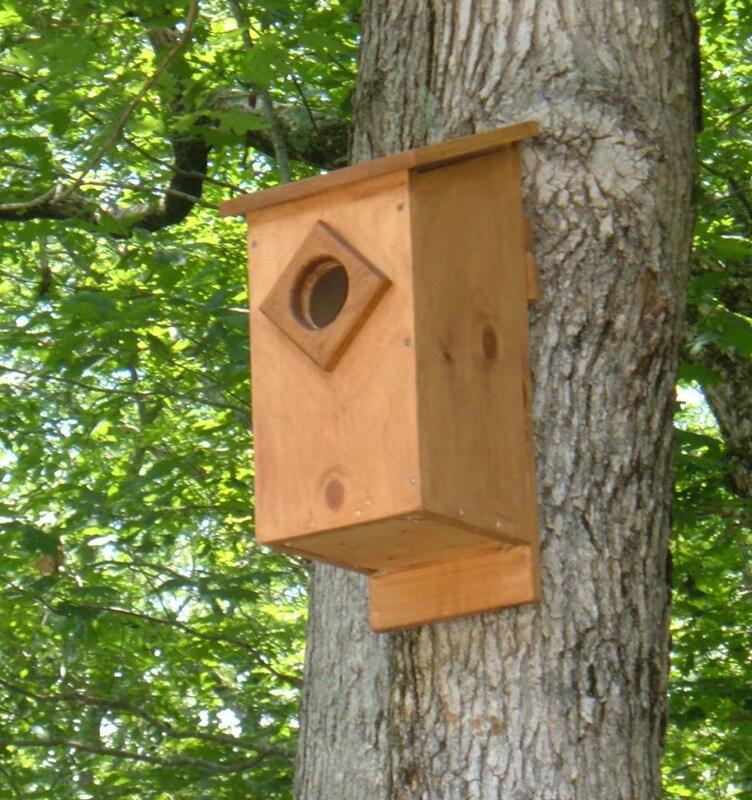 It's actually far easier than it looks, and can be made using a powered mitre saw, a bandsaw with a sled, or even just a hand mitre saw/box. Find out how! 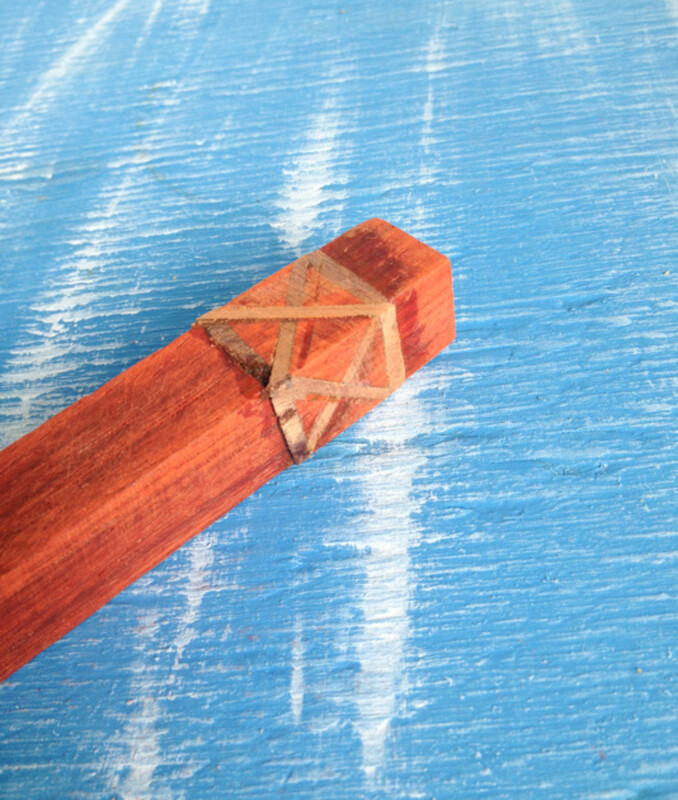 For the tutorial, I used a paduk blank and strips of Hawaiian koa wood. 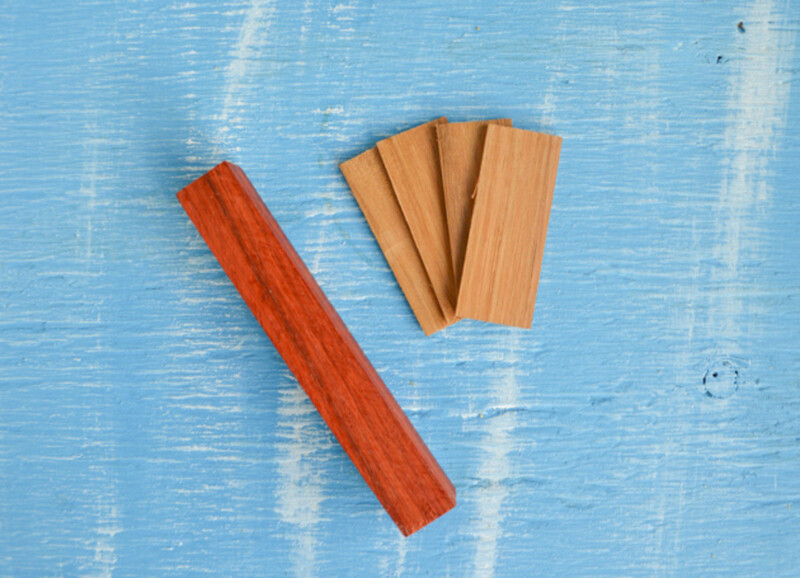 First and foremost, you need an appropriately sized pen blank. If this is your first time making a segmented blank, I highly recommend you chose something easy to work with that isn't prone to splintering constantly. In other words, avoid woods like wenge! You need to turn slowly and carefully to get the hang of it or else you can easily gouge chunks out of your design. As with any pen, choose a blank that works with your pen kit. If you're making a hefty pen, go with a 1" blank (or whatever your kit calls for), but consider using something smaller, like a 5/8" blank for a slimline. You also need a contrasting material for segmenting. 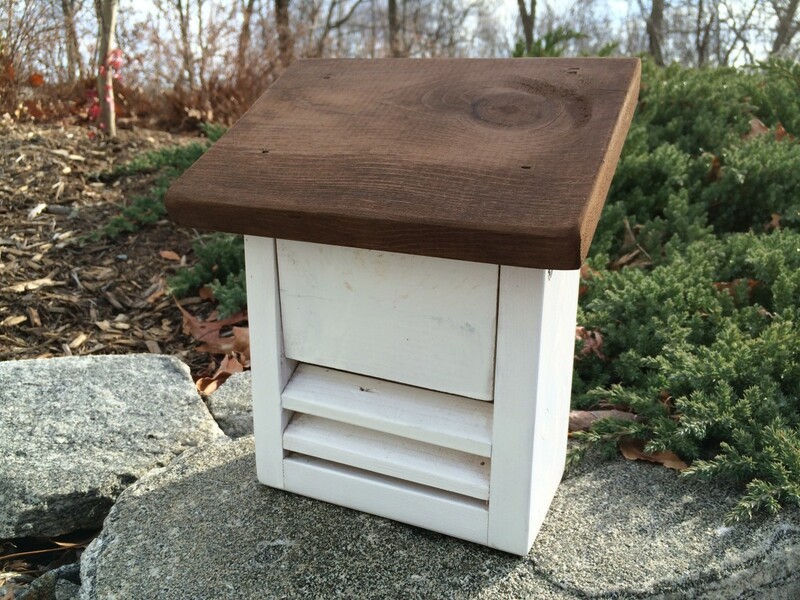 I like to use strips of wood that are about 1/8" thick or less, but you can use veneer, acrylic, or even metal. Sandwiching a piece of wood between two strips of veneer creates a striking appearance and a beautiful finished design! Variety packs are a fun way to explore and see what woods you like! Of course, you'll also need glue. I use medium CA, but I know other people prefer to use wood glue. I like to make my blanks up in one day without waiting for hours, so I use CA, instead. I do not, however, use accelerator. It's a matter of personal preference, but I've had bad experiences in the past with accelerator making CA excessively brittle. 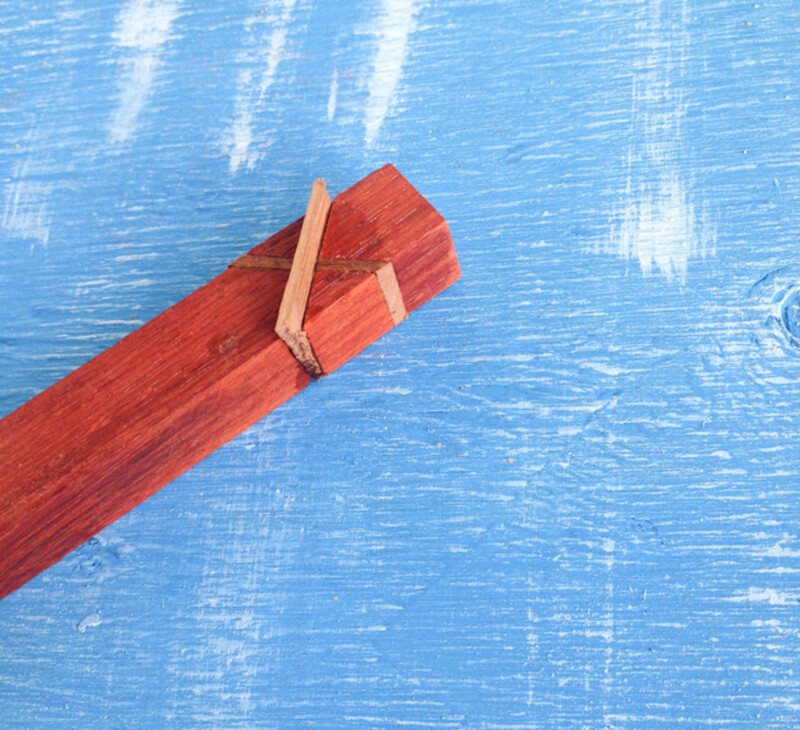 You may also want an adjustable square and a pen or pencil, and you'll need a saw. 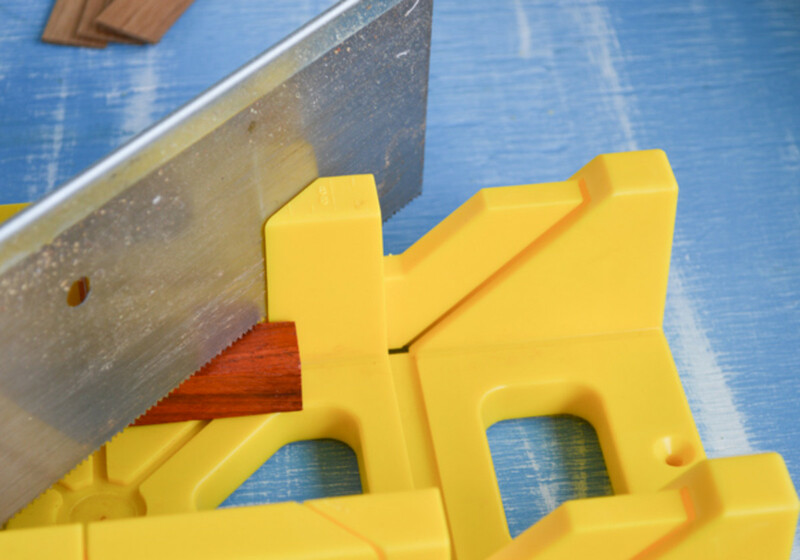 A powered mitre saw works, as does a bandsaw with a jig for the angle, but a hand saw and mitre box work well, too. I actually prefer to make my cuts by hand. They're small and quick, and I feel like I have more control over the situation. 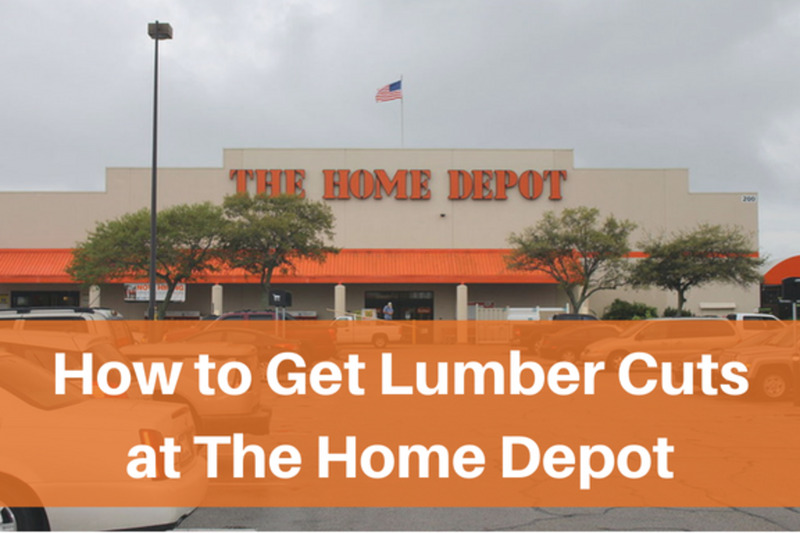 Also, the cuts tend to be fairly clean and don't need much sanding. Lastly, a bit of sandpaper is helpful - I usually use 120 or 150 just to clean up any rough cut edges and 80 or 100 grit to clear away excess contrasting material after each glue up. 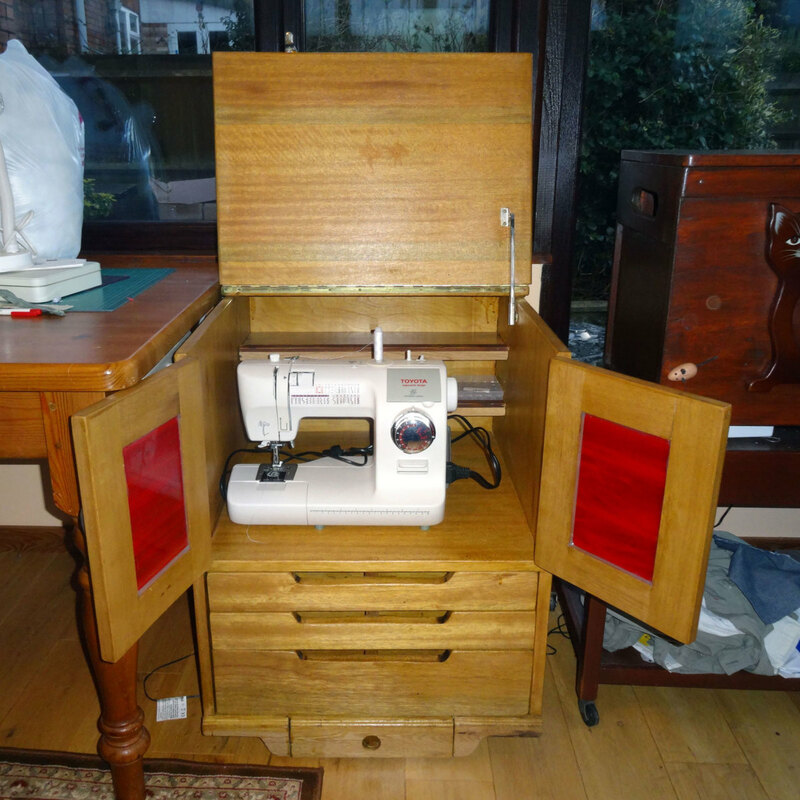 The finished design is elegant and seemingly complicated, but the blank actually only takes four cuts. I show all cuts at a 45 degree angle, but you can play around with your angles, if you'd like. Whatever angle you choose, use the same one throughout the process. 1. Decide where on your pen you'd like the knot to appear. I usually position them around the upper top, so I measure an inch or an inch and a half from the blank's end and then begin my cut. Wherever you choose, make a cut at 45 degrees. 2. Sand any rough edges, if needed, making sure to keep the cut faces flush. 3. 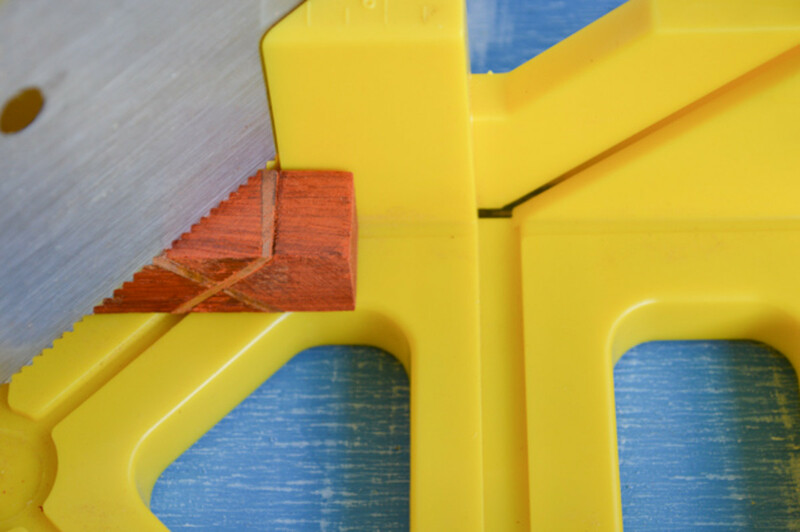 Glue a piece of your contrasting material to one 45 degree face, then glue the other face in place, making sure to line up the blank's edges as well as possible. 4. Allow the glue to set before moving on. I let my non-accelerated CA cure for about 15 minutes to ensure a solid bond. 5. Cut/sand away excess contrasting material to make all sides of the blank as flush as possible. 6. 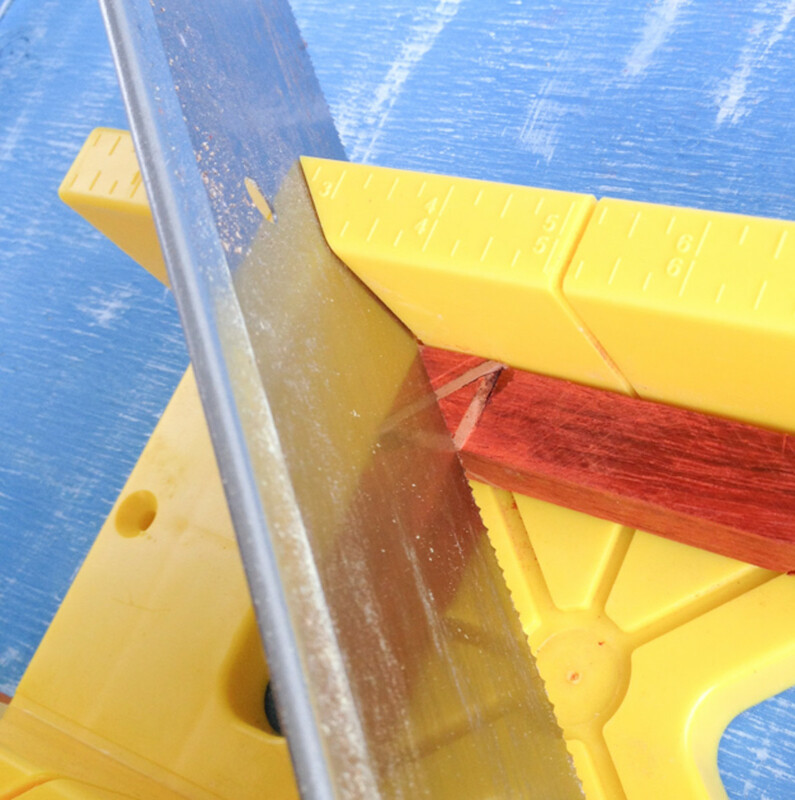 Use your adjustable square and pencil to make the point opposite the upper and lower edges of your first cut. 7. 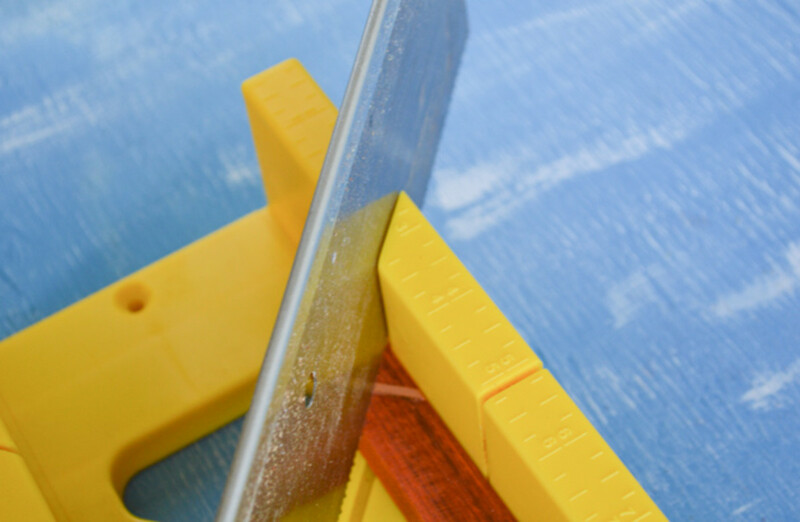 Make your second cut, taking care to line the top and bottom up with your first cut to create an "X." 8. Repeat steps 2-5 above for the second cut. 9. Rotate your blank a quarter turn in either direction and make your third cut, positioning it so the top and bottom line up with the top and bottom of the X you just finished making. It's difficult to describe in words, so please look at the picture below for a visual. 11. You're almost there! All that remains is completing your second X. 12. Repeat steps 2-5 for the final time. 13. Finally, I like to add extra CA to the finished segmented design to help fill in any gaps and prevent blowouts. 14. Use your new blank normally for your next pen turning project and enjoy! 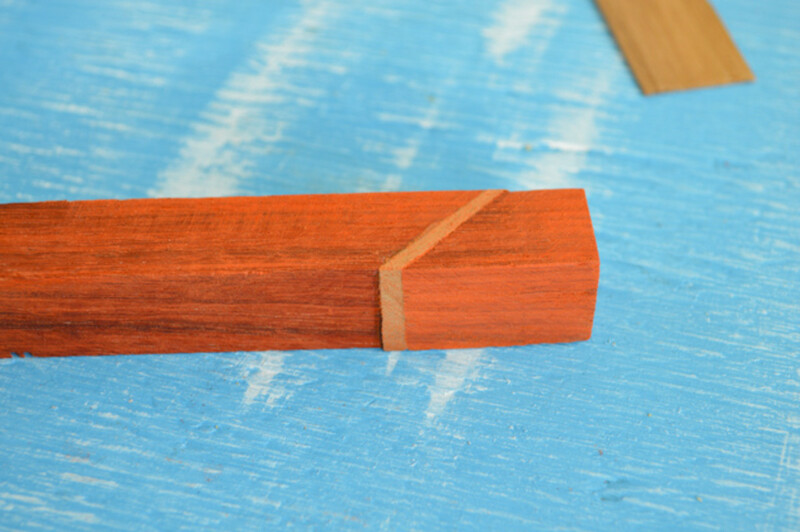 Turning a segmented blank is basically like turning a plain blank, but there are a few things to keep in mind. 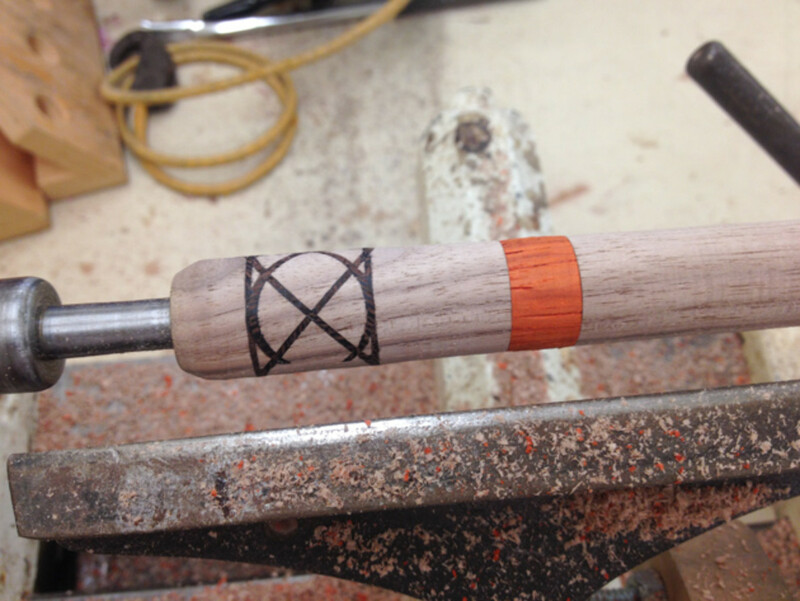 Make sure you drill the segmented blank as centered and straight as possible. 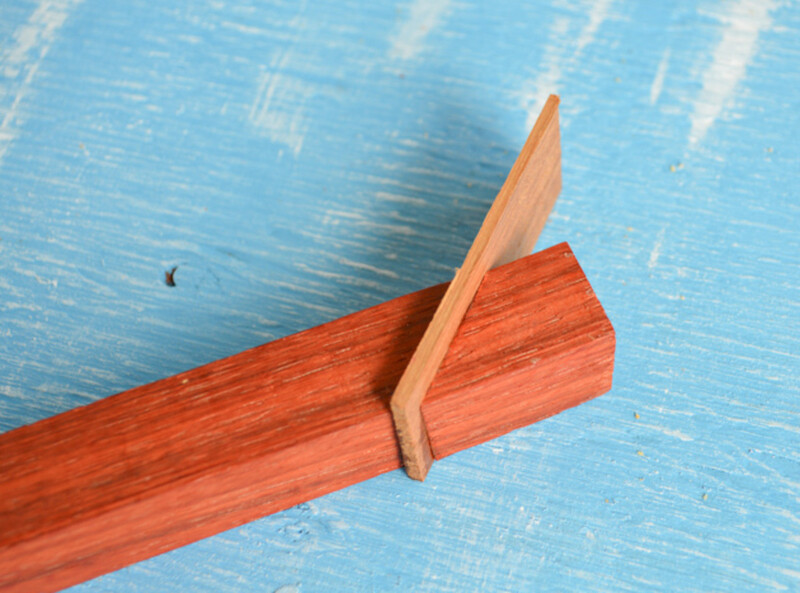 You probably always want a centered, straight hole, but it's particularly important with segmented blanks! If your hole is off center or crooked, the finished design will look weird. 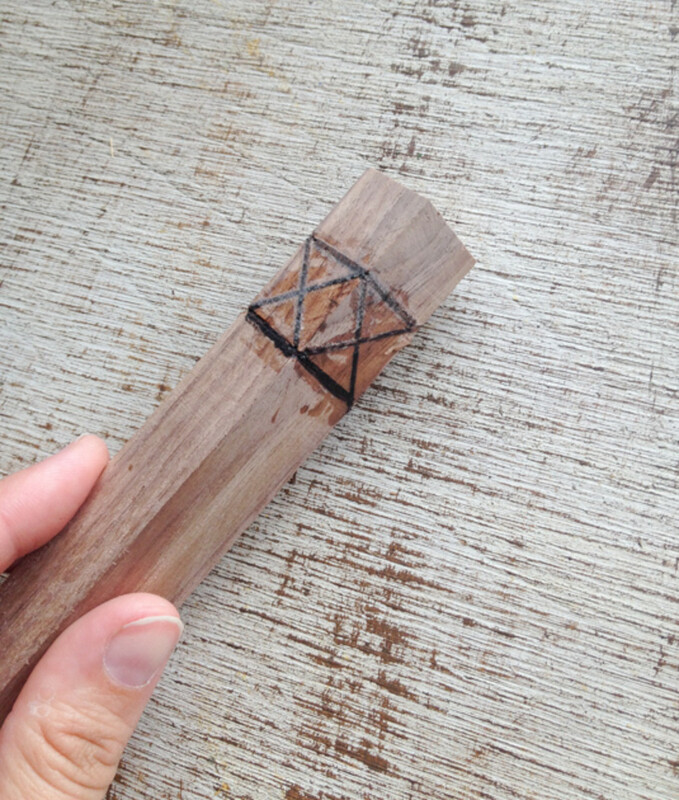 Turn cautiously, especially if you haven't turned a segmented blank before or are working with difficult woods. You don't want a blowout that ruins all your hard work! Have fun! 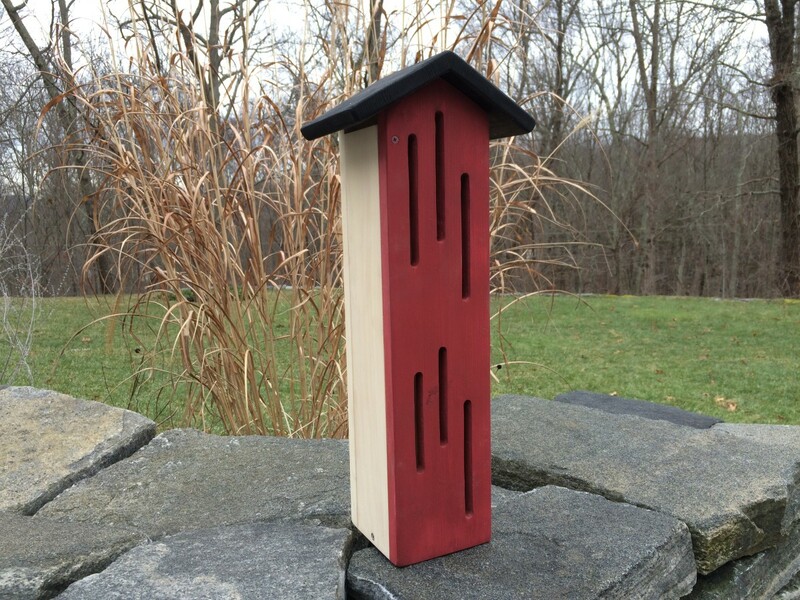 This is just a basic segmented design - there are plenty of ways to mix it up. For example, in the picture below I added a strip of contrasting material (in this case, wenge) along the top and bottom of the knot. It seems kind of crazy that two straight X patterns can form a curving, looping knot, but you'll see the design take shape as you turn. Decide you'd rather buy a ready made pen? Check out the shown pens and more in my store! Before you know it, you'll have a pen that makes people ask "Where did you buy that?!" After you explain that you made it, expect the next question to be if you'll make one for them. It happens frequently to us! 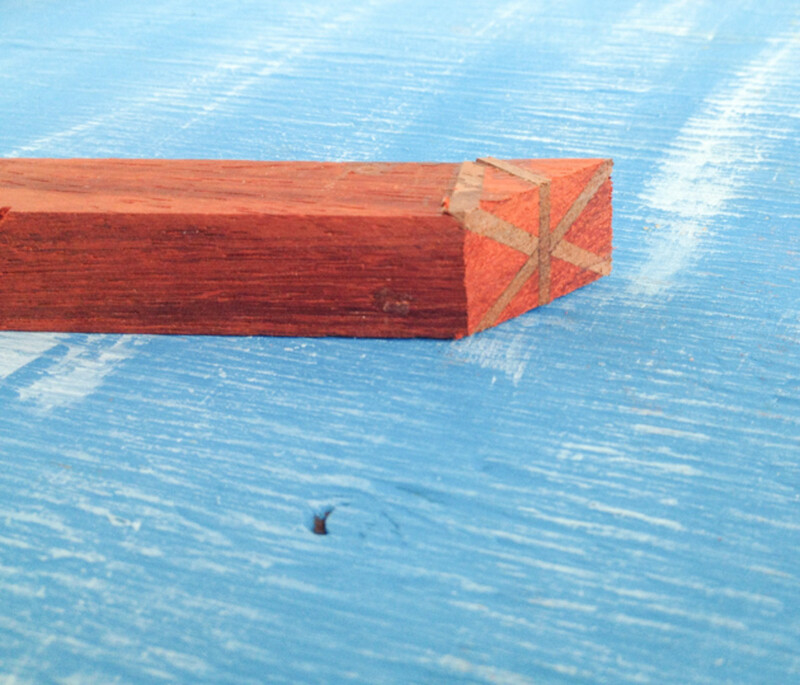 Here's another example where I made the segmented design over an already segmented portion of the pen. I love creating segmented blanks and seeing how they turn out, and I never would have started down this path without "picking up" a digital copy of The Pen Turner's Bible. It is a fantastic, informative read that really opened my eyes to the possibilities! 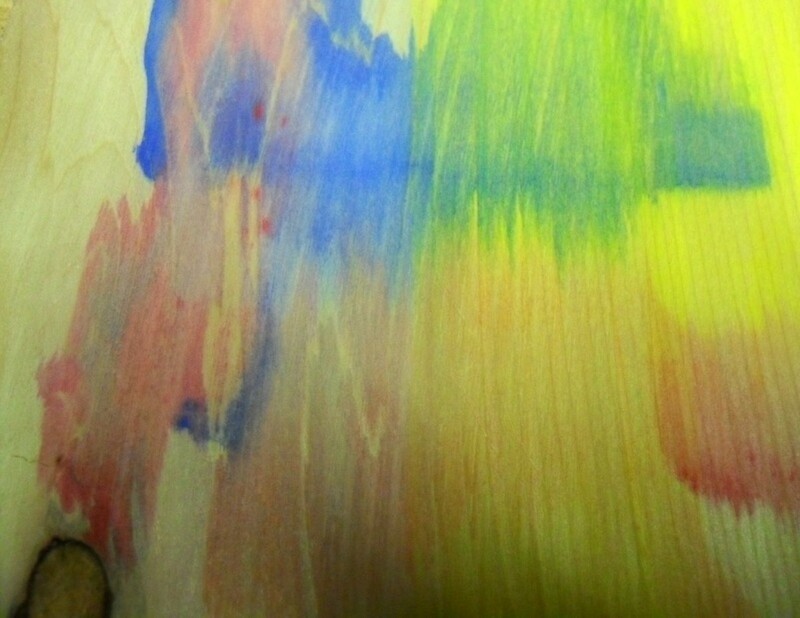 Whatever variation you decide to use, I hope you have fun creating segmented blanks and turning pens! If you have any questions about the process, please leave a comment and I'll do my best to answer it in a timely manner. Thank you for the refresher, I made some a few years ago & lost my prints so you saved me wasting a lot of time & wood! GOD bless you & keep up the good work!! Thank you for considering the beginner. 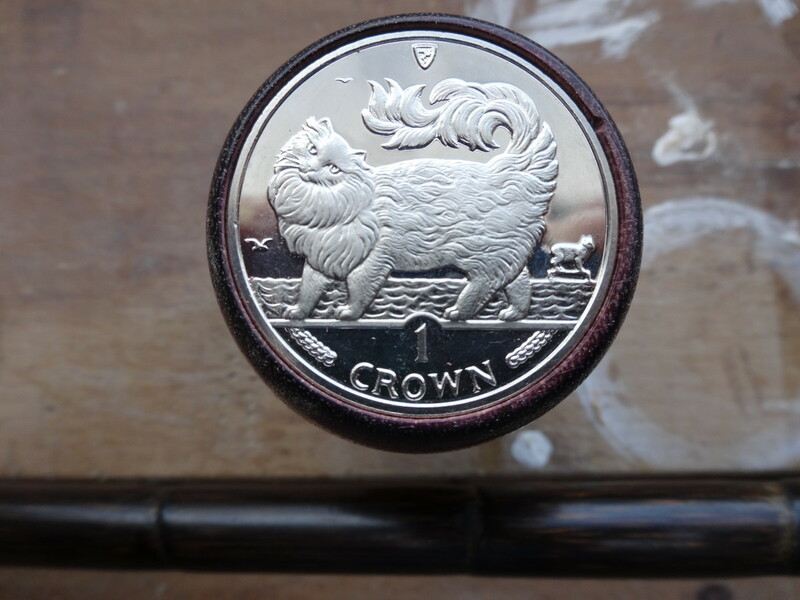 I used to use a lathe daily then after life took over it's been 30+ years. Starting back to turning. Any advice is greatly appreciated. Thank you For taking the time to put this together you did a great job. Hi: Thanks for the instructions, but I am mystified how you got from the third line to the fourth. 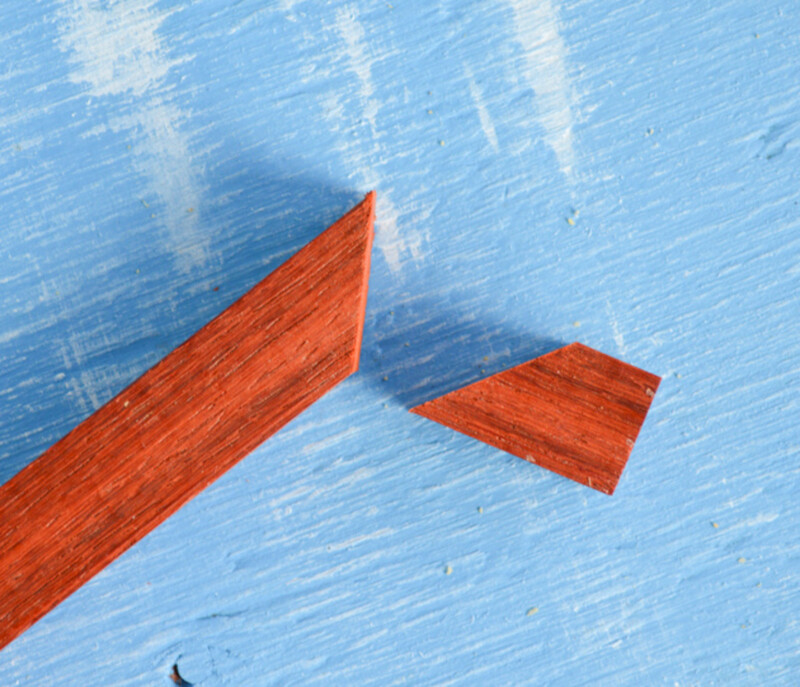 Your picture shows the three lines, with the 45 degree angle, then the next picture shows it finished with four lines, and a bit of wood above them. How did that happen? Gorgeous! Voted up. Very crafty. Impressive. Yes, they make fantastic gifts! I'm sorry your father is no longer with you - he sounds like a talented man. Wow, if my father was still alive, I'm sure he would be making these. 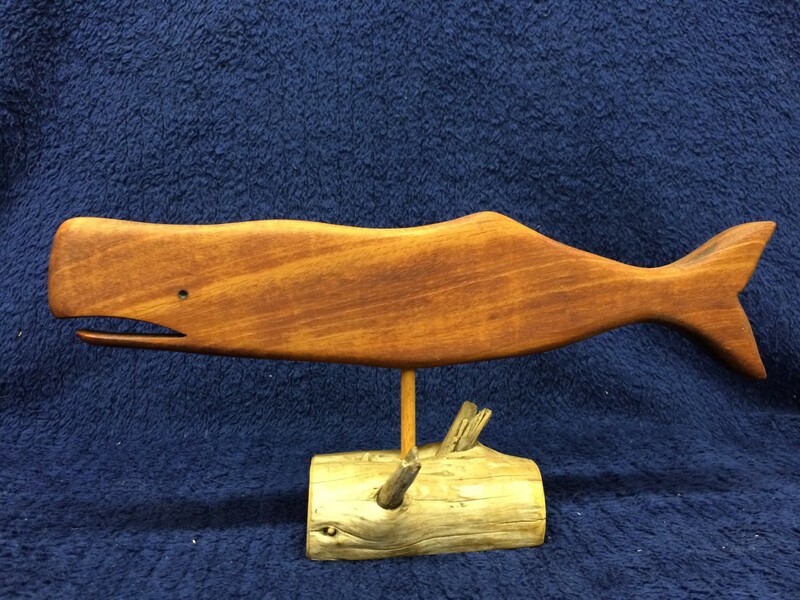 He could make anything out of wood and had the right tools for whatever he made. This is awesome and what beautiful designs. They would make incredible gifts! Your creation is beautiful. I do have a couple of these wooden pens in the home but they are for display only. Your post is very detailed and interesting. Wow! Gorgeous and it's even better that you made it. I have seen these in shops and wondered how in the world people managed to do this. Now I have a clue. Thanks for this fantastic hub as it provided insight into true craftsmanship. It's frustrating when you're trying to figure something out and can't find information, but it's nice sometimes because you know you can fill a need! Thanks for stopping by. I have definitely been there with deciding to write an article because of the lack of resources available. I'm sure that your tutorial will be a great asset to many people pursuing this interest! Thanks for sharing. That was really interesting, Natashalh, and your work is beautiful. I don't think I'll be trying it myself- already being involved in many crafts already- but I love to learn about how anything is made. Yes, it is kind of odd looking if you don't know what it means! I decided to write the hub, anyway, because I was frustrated by a lack of written tutorials with pictures (there are a couple of great video tutorials out there). It's been a good summer so far, but a very busy one! I hope to have more time for writing in a month or so. I had to read the article to figure out what the title meant. LOL It's always good to see a new article by you. I hope you are doing well and enjoying your summer vacation.